Obama to Netanyahu: U.S. will "always have Israel's back"
President Obama insists that the United States will "always have Israel's back" when it comes to security, but that doesn't mean the two nations see eye to eye when it comes to how to deal with the threat posed by Iran acquiring nuclear weapons. In a joint appearance with Israeli Prime Minister Benjamin Netanyahu before the two men met at the White House Monday, the president called Israel one of America's "greatest allies" and deemed the bond between the two nations "unbreakable." But underlying the positive rhetoric were U.S. fears that Israel is moving too quickly toward military action against Iran. In the meeting, Mr. Obama was expected to push Netanyahu to defy the more hawkish voices within the Israeli government and give diplomacy and sanctions more time to work. The White House said late Monday afternoon that the meeting went for "several hours." "The President reaffirmed the United States policy to prevent Iran from obtaining a nuclear weapon," the White House said. "He reiterated the United States' commitment to pursuing a strategy of principled diplomacy, backed by unprecedented pressure, including the additional sanctions that are taking hold on the Iranian regime. He further reiterated that all options are on the table to prevent Iran from obtaining a nuclear weapon." Before the meeting, Mr. Obama said it is "unacceptable from Israel's perspective to have a country with a nuclear weapon that has called for the destruction of Israel." He added that it is unacceptable for the United States as well, since the U.S. would like to avoid a nuclear arms race in the Middle East and does not want to see terrorists or a state sponsor of terrorism with a nuclear weapon. But the war-weary president added before the ninth meeting between the two leaders that both he and Netanyahu hope to avoid a military conflict. "We do believe that there is still a window that allows for a diplomatic solution," Mr. Obama said. 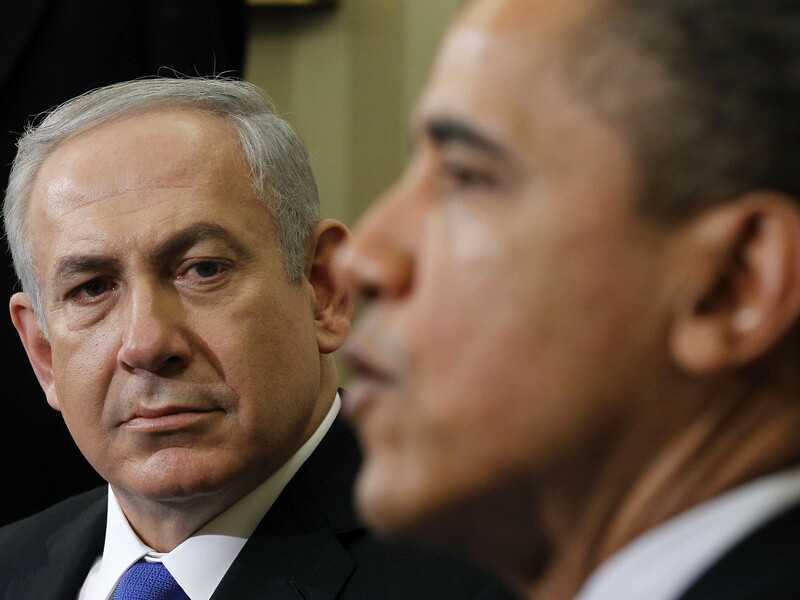 Netanyahu said after emerging that he felt Mr. Obama "understood Israel's position," according to the Associated Press. Israeli leaders say they have not made a decision on whether to attack Iran. Before the meeting, Netanyahu thanked Mr. Obama for a "strong speech" to the American Israel Public Affairs Committee (AIPAC) Sunday during which the president hit many of the same points that he did in his remarks Monday. The two men have had a strained relationship in recent years, largely focused in the past on how to deal with the question of Palestinian relationship. "Iran's leaders should understand that I do not have a policy of containment; I have a policy to prevent Iran from obtaining a nuclear weapon," the president told the powerful lobbying group. Mr. Obama also said there had been "too much loose talk of war" and suggested sanctions against Iran are having an effect. Netanyahu is set to speak to AIPAC tonight. Monday's meeting comes amid questions over what role the United States would play if Israel unleashes an attack on Iran's nuclear facilities. Iran denies it is seeking nuclear weapons but is simply developing nuclear energy capability. Before meeting with the president, Netanyahu cast Israel as America's only "reliable, stable, faithful ally" in the Middle East, though one with "the sovereign right to make its own decisions." He said his role Monday was to "ensure that Israel remains the master of its fate." Netanyahu has previously laid out his demands for Iran, which include that the country "dismantle the underground nuclear facility in Qom, stop enrichment inside Iran, and get all the enriched material out of Iran." In his remarks Monday, Netanyahu did not mention sanctions or discuss the prospect of a peaceful outcome to the standoff.